Hot or cold, temperature won’t stop many from obtaining their caffeine fix. Depending on the weather and personal preferences, coffee drinkers at home can brew coffee by one of two ways: hot brew or cold brew. Many are familiar with hot brew coffee. The equipments used for hot brew are widely recognized, and even iconic: the moka pot, French press, Vietnamese coffee filter, and Chemex, to name a few. These equipments, as with all hot brew techniques, involve pouring hot water over a bed of coffee grounds, at a general proportion of 1 oz. coffee to 8 oz. hot water . (That’s 2 level tablespoons per 1 cup of water, on a more home-friendly scale.) The resulting liquid, coffee, is then separated from the grounds and ideally consumed as soon as possible. Cold brew demands more patience. In a Mason jar, French press, or Toddy system, coffee grounds are mixed with room temperature water, and then left to sit for hours—anywhere from three to twenty-four hours—before the solids are filtered out. Cold brew recipes often call for a higher coffee to water ratio: 1 part coffee to 4 parts tepid water, which compared to hot brew, is 2 oz. coffee per 8 oz. water (roughly 4 tablespoons per 1 cup water). Once the grounds are removed, what’s left is black coffee concentrate that is thinned with water or milk before it is served. On the surface, the distinctions between the two methods seem self-explanatory. Hot brew quickly produces fragrant java with bite and acidity, whereas cold brew rewards patience with condensed coffee that is smooth and sweet. To begin to understand the flavor profile differences, it helps to first get acquainted with the coffee grounds. Coffee grounds contain a hodgepodge of volatile and non-volatile components, such as various oils, acids, and other aromatic molecules . Collectively, these compounds that are found in coffee grounds are referred to as “coffee solubles” and significantly contribute to coffee flavor . Brewing is the process of extracting these components from the grounds, so coffee beverages are technically a solution of coffee solubles and water. Given that coffee grounds are used in both of our brewing methods, the principle variables are temperature and time. Temperature affects the solubility and volatility of the coffee solubles. Relative to brewing, solubility describes the ability of the solubles to dissolve out of the grounds and into the water; volatility refers to their ability to evaporate into the air. Coffee solubles dissolve best at an optimal temperature of 195-205°F . With more coffee solubles extracted, hot brew coffees are described as more full-bodied and flavorful when compared to cold brew. Moreover, due to increased volatility with higher temperatures, the aromatics are more readily released from coffee, giving rise to that beloved scent of freshly-brewed coffee. On the downside, oxidation and degradation also occur more rapidly at higher temperatures. The oils in coffee solubles can oxidize more quickly at elevated temperatures, causing coffee to taste sour. Acids also degrade, the most notable of which is chlorogenic acid into quinic and caffeic acid, causing coffee to taste bitter . Where cold brew lacks in temperature, it makes up for in time. Coffee solubles have markedly decreased solubility in room temperature water. Increasing the brew time from a few minutes to many hours aims to maximize extraction of the solubles from the grounds. Even over twenty-four hours, not all the coffee solubles will have dissolved; this is why the amount of coffee grounds is doubled, in an effort to make up for the lower extraction rate. In comparison with hot brew, cold brew is sometimes described as tasting “dead” or “flat” due to the lower yield of coffee solubles . Further, decreased volatility prevents aromatics from escaping from coffee as easily, so cold brew is much less perfumed than its hot brew counterpart. Oxidation and degradation will still occur in cold brew methods, but this happens much more slowly; bitterness and acidity are just about absent in cold brew coffee, especially if it is kept cold. Though, cold brew doesn’t merely taste like hot brew without the bitterness. Fans of the cold brew method have emphasized that cold brews contain a completely different flavor profile that can’t be found with hot brews. Going back to the idea of solubility, not all flavor compounds of coffee solubles are equally soluble. A good majority of the coffee solubles are still able to leach out of the grounds, even in colder water. The compounds that don’t dissolve are the ones often attributed to unfavorable flavors : these stay in the grounds that are subsequently tossed away. Consequently, cold brews take on a much sweeter, floral profile. To note, brew time does not determine caffeine content, nor does bitterness indicate coffee strength. Caffeine is extracted early in the brewing process, so extending brew time, by either method, would only result in over-extracted coffee . Coffee “strength” is defined as the amount of dissolved coffee solubles per unit of coffee volume . On that train of thought, cold brew certainly produces stronger coffee, given that the brewing process purposely concentrates the coffee solubles. Though, keep in mind that rarely anyone drinks cold brew coffee straight up; many enjoy this smooth drink diluted with milk or water. Whether you’re an adamant hot brew addict or a die-hard cold brew fanatic, at least coffee drinkers can agree that as long as there’s caffeine, everything’s mellow. 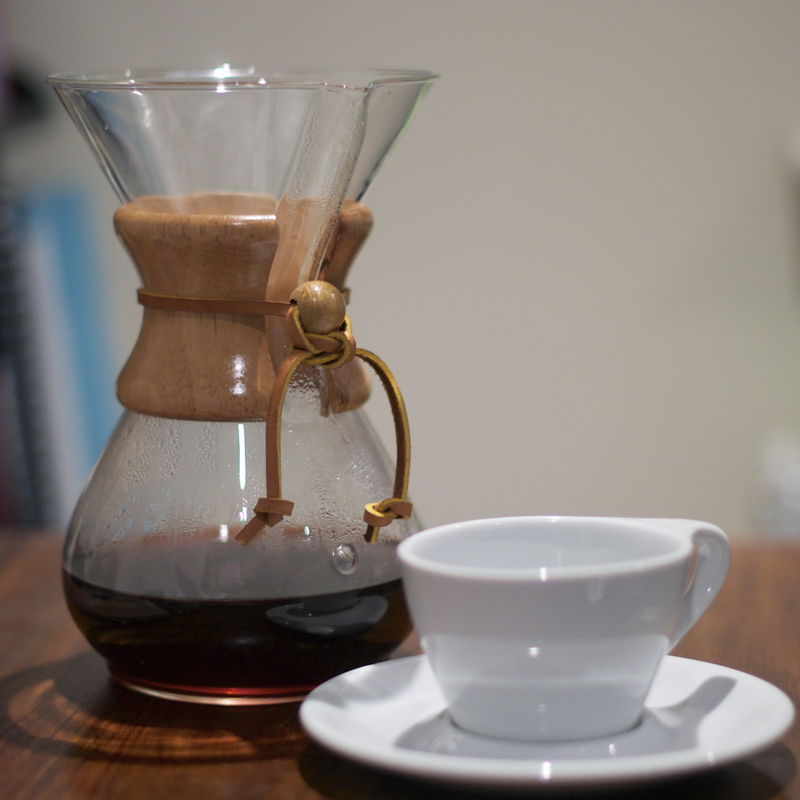 Brewing—How to Get the Most Out of Your Coffee. Mountain City Coffee Roasters. Giuliano, Peter. 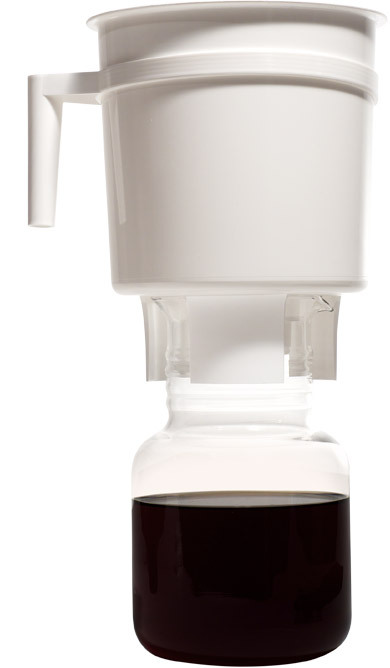 “Why you should stop cold-brewing, and use the Japanese Iced Coffee Method.” Dymaxion. What Everyone Ought to Know About Iced Coffee & Cold Brew. (2012, June 26). Prima Coffee. Tags: chlorogenic acid, coffee, cold brew, flavor chemistry, flavor compounds, hot brew, oxidation. Bookmark the permalink. “Though, keep in mind that rarely anyone drinks cold brew coffee straight up; many enjoy this smooth drink diluted with milk or coffee.” Did you mean “diluted with milk or water.”? Or do people really dilute cold brew coffee with hot brew coffee? I drink it straight up and it’s pretty darn good. All though I may only drink 3 oz. Great post! Thank you for the background and diligence. A quick question regarding the ending statement. “To note, brew time does not determine caffeine content, nor does bitterness indicate coffee strength. Caffeine is extracted early in the brewing process, so extending brew time, by either method, would only result in over-extracted coffee”… By the nature of this being a concentrate, and the caffeine extraction happening early on. Wouldnt this have 4x the amount of caffeine per uncut oz of liquid compared to hot brew as a result of using 4x the amount of grounds per oz of water? Cold brews would definitely contain a higher caffeine content, since it uses a higher coffee grounds to water ratio compared to hot brews. Since cold brews are concentrated though, some people prefer to dilute their cold brew coffee with water or milk, which ultimately cuts down on caffeine concentration. I’m a little confused. Making cold-brew you use a lot more coffee to water, and the result is a concentrated coffee, that people then dilute. Why not just use more water to start with, and end up with a regular strength? Or is the concentrate preferred because the finished product is almost always mixed with ice? I have had cold brew and I like the taste, but it does seem awfully expensive to brew this way all the time. The idea is that because coffee solubles are less soluble in room temperature or cold water, cold-brew increases the amount of coffee grounds in order to make up for the lower solubles that end up in cold-brew coffee. The result is a concentrate that some people like to drink straight and some like to drink diluted. Still doesn’t make much sense. If what you actually end up brewing is stronger-than-desired coffee, then you weren’t “making up for” anything, you were just overdoing it on the concentration. That doesn’t make sense. You increase the amount of grounds because there are less solubles and then you get a concentrate? The previous answer was not worded well or at all clear, so we’re very sorry about that. Donjoe’s comment above better explains the extraction process during cold brew. Thank you, Donjoe. Many cold-brew recipes call for a high coffee-to-water ratio (compared to hot brews), but if you’d rather not end up with a concentrate, there are no hard-and-fast coffee rules stopping you from using less grounds or more water. As with many recipes, it primarily comes down to a matter of personal tastes. Thank you, Donjoe, you explained it brilliantly. It just didn’t make sense to me that “cold brew” method itself could be responsible for making the resulting coffee more concentrated, when in fact the stronger coffee is clearly because you use four times as much grounds! BUT now I get it – people use four times as much grounds on purpose to make a concentrate so they can use it to make the beverage the way they want, diluting with fresh cold water or milk/cream/non-dairy milk and probably ice, too. Makes sense that you would want to make a concentrate to work with as your starter for iced beverages. Tthe concentration is neither here nor there – it’s something you can control by using more or less grounds, just like with ANY brewing method. The TRUE difference with the cold brew method, I see now, is that you greatly increase the TIME of brewing because things are less soluble at the cool temperature. (That, and the fact that DIFFERENT flavors are extracted/not extracted with this method vs. hot methods.) That concentration thing was really nagging at me, and now I get it! Thanks, Donjoe! I don’t think there’s even that difference between hot and cold brewing. As far as I understand it so far, brewing time has all of the effects of temperature: let the coffee sit in water long enough (24h+) and you will get all of the same flavors – including the bitterness – that you would get with hot water methods. At least that’s what I got when I brewed at room temperature for 26 hours as a test. And then you will have the same problem with keeping the resulting coffee in the fridge for later: the extra oils you got in there during the last hours of the brewing process will oxidize in time, giving your stored coffee a progressively worse taste. That’s why cold brewing is the preferred method when you intend to make sweeter coffee: with brewing times of 10-20 hours it’s easier to find the right moment to stop the process right before the bitter and oxidizable oils are extracted, which gives you a sweeter drink that can be stored in the fridge for longer and that works better as a cold-served refreshment. The flip side is you’re extracting less flavor per unit of weight of ground coffee used, so in this respect your original concern remains justified: you do have to use more grounds than with the hot water methods to get a drink that feels just as concentrated without being bitter. I make Toddy cold method because it makes the closest thing to espresso without actually making espresso at home which I’ve always been disappointed with. I only dilute it with heavy cream and it makes a sumptuous coffee drink. I freeze half of it and refrigerate the other half and drink 2 ounces in the morning. The added bonus is I only need to clean up the coffee making process once every two weeks or so. If cold brew is kept in a key keg, a keg that is never exposed to gas, will it be able to last at room temperature? I know a lot of times its refrigerated because gases will spoil the coffee but what if there are no gases and the kegs are stored in a warehouse for a couple weeks? What would the life span be? Pingback: Coffee straight from the tap? – Caffeinated Mess.